President Obama will not be allowed to abandon the Yucca Mountain, Nev., nuclear repository if they have their way, said Democratic and Republican congressmen Friday. 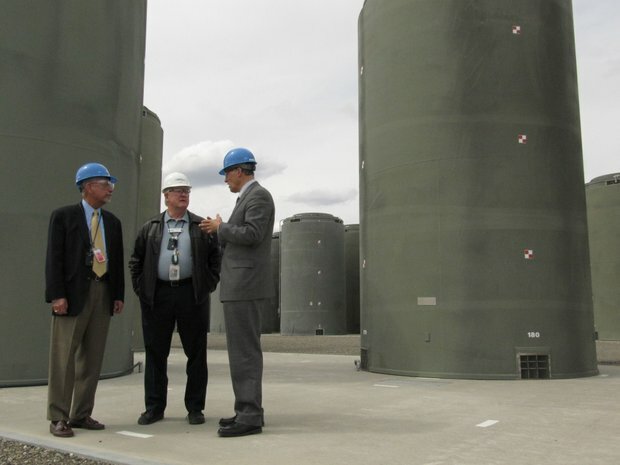 Rep. Doc Hastings, R-Wash., and Rep. Jay Inslee, D-Wash., visited the Columbia Generating Station's fuel storage lot north of Richland on Friday with Vic Parrish, Energy Northwest chief executive, to discuss the future of irradiated fuel stored there. "We do not intend to allow any administration to shut down Yucca Mountain and leave us with a mountain of waste and a mountain of debt," Inslee said. Not only is ensuring that the nation have a place to dispose of weapons and commercial nuclear waste an important issue to those who live in the Tri-Cities, it's also important to his west side constituents, he said. Waste from commercial nuclear power plants, like Energy Northwest's Columbia Generating Station, and high-level radioactive waste left from weapons production at the Hanford nuclear reservation was expected to be sent to Yucca Mountain. But Obama pledged to end the project during his presidential campaign and his administration has moved to withdraw the license application for the project and prevent it from ever being refiled. Hastings and Inslee believe that because an act of Congress designated Yucca Mountain as the nation's high-level nuclear waste repository, the Obama administration lacks the authority to terminate it. "We'll have the last say because we had the first say," Hastings said. The majority of congressional representatives and senators agree with Hastings and Inslee that shutting down Yucca Mountain is a bad idea, Hastings said. Northwest ratepayers have been charged fees of $290 million on the power they've used from the Columbia Generating Station to pay for construction and operation of a national repository and continue to pay into the fund. But after Yucca Mountain failed to open as planned in 1998, Energy Northwest began building an above-ground storage pad for the fuel in 2001. The outdoor pad near the power plant now holds 27 casks of used fuel and will have 39 by 2014. This spring a federal court awarded Energy Northwest nearly $57 million because of Department of Energy delays in opening Yucca Mountain. That covers the costs of the storage pad's licensing, design, construction and security, plus the 122-ton steel and concrete storage casks and the heavy equipment needed to move them. DOE has filed notice that it plans to appeal the decision. DOE has spent about $10 billion on Yucca Mountain, engineering it so conservatively that there is no reason not to move forward with it, Inslee said. "It's the most characterized rock on planet Earth," he said. The Obama administration has appointed a Blue Ribbon Commission to study what to do with the waste that was expected to go to Yucca Mountain, but it has been told that Yucca Mountain cannot be considered as one of the options. That puts Hanford at risk of being designated the replacement waste repository for the nation, Inslee said, pointing out that Hanford is on the Columbia River. It also raises questions about the future of nuclear energy in the nation. "The bottom line is if we are going to have a robust nuclear policy in this country, we are going to have to have a national repository," Hastings said. Washington state and three Tri-City business leaders also have filed lawsuits over the matter in the U.S. District Court of Appeals. Earlier this week the court denied Washington state's request for an injunction that would prevent DOE from continuing to dismantle Yucca Mountain operations.